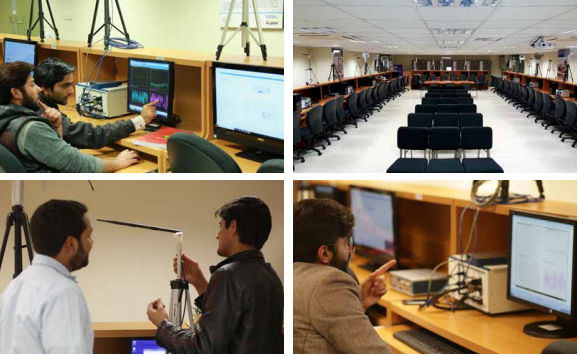 At ITU, our students have access to a wide array of subjects, Including Electronics, Communication Systems, Control Systems, Power Systems Analysis, Microwave Engineering, Digital Signal Processing, Renewable Energy, Bio Electronics, Robotics and Photonics. At EED students are provided an opportunity to supplement their learning through practical work in the modern laboratories. Lab experiments are designed in coherence with theory. Students get confirmation of theoretical concepts by performing experimental work in the labs. 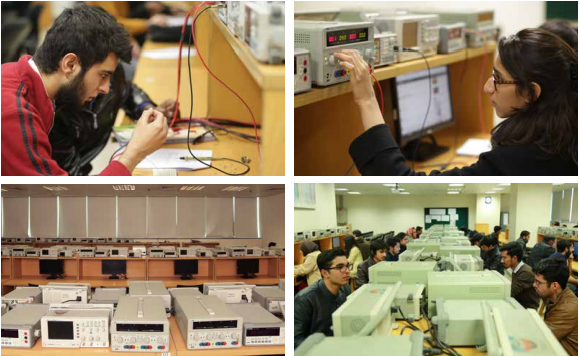 The courses and trainings offered in Electronics lab form the basis of understanding the working of electrical circuits and its components. Lab contains a number of latest technology equipment that include digital storage oscilloscopes, DC power supplies, digital multi-meters, function generators, LCR meters, diodes, transistors, electronic ICs, resistors, capacitors etc. 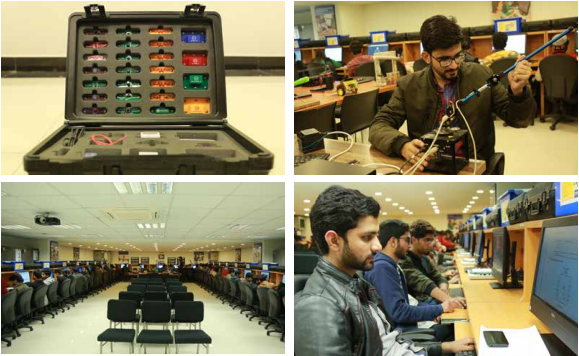 Electronics lab not only possess latest laboratory equipment and trainings but also enables the students to design and build projects such as robots and various electrical circuits to solve wide range of local problems. Control Systems Lab provides hands-on experience in designing control algorithms and devices that can drive a wide range of mechanisms. Students can utilize a broad collection of state-of-the-art software and hardware tools (from NI, Mathworks, TI and Xilinx) available to build highly effective machines, sophisticated control systems, versatile rovers and innovative biomedical devices. Moreover, it has a wealth of resources to teach the students the fundamentals of Newtonian Mechanics, Engineering Design, Feedback Control, Industrial Control, and Robotics. 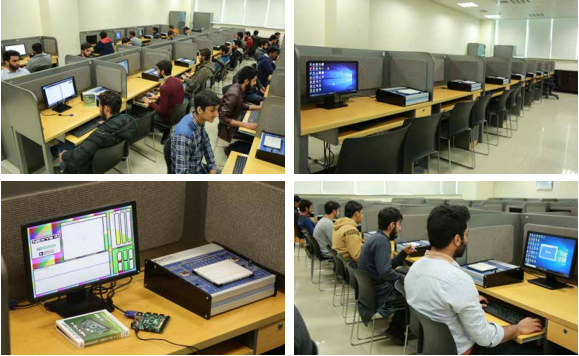 The lab is equipped with 12 workstations with complete training modules for electro-mechanical systems. Each workstation includes LAB VOLT equipment with LVDAC-EMS software. A hybrid-energy module is available consisting of solar/wind energy training system. The dissectible machines are important tool of learning which can be re-assembled using stators, rotors, armatures, rheostats, and capacitors as components. 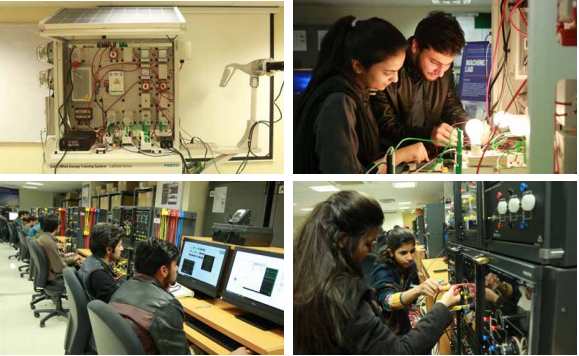 The lab offers courses like Electrical Machines to Electrical Network Analysis. The Communications lab offers the fundamental concepts of Analog and Digital Communication Systems to the undergrad as well as graduate students. The lab is furnished with workbenches consisting of two software defined radios (SDRs) each connected with a high-end systems via the usb3.0 interface. 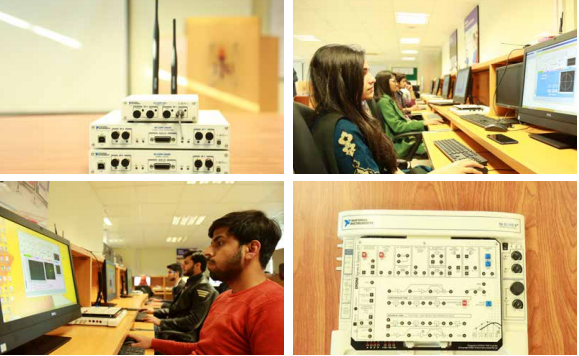 The radios are full duplex, multi input multi output (MIMO) capable, and support an instantaneous bandwidth of 20 MHz which enables the students for rapid prototyping of various fundamental concepts in Analog and Digital Communication. Lab conducts microwave and antenna engineering. The lab is equipped with state of art vector network analyzers (VNAs) and microwave components such as resonators, couplers, filters, amplifies, oscillators and mixers. Meanwhile, different antennas like dipole, yagi yuda, horn, helical, parabola and patch etc. are provided. Students are trained to simulate these microwave devices (on HFSS or CST) along with extracting, comparing and analyzing different parameters (via hand-on experiments) like scattering, impedance and radiation patterns which develop their engineering skills in microwave domain.